The heaven rejoice for a new child is born, a baby god has arrived, a new king has been made, he is welcome into the royal family with such celebration. The heaven could not contain there joy. Choir could be heard from a distance. The kingdom of darkness is in confusion, they have lost a soul and a battle. The Prince of darkness fold his hands in amazement, he couldn't do anything. The captive had be delivered from the hands of the mighty. The chains lies on the ground broken, shattered into pieces because the truth has set the captive free and a new baby is born in God. This is the greatest miracle ever and the world do not understand. The natural man thought noting has happened, he didn't see the commotion in hell nor the joy in heaven. He couldn't hear the beautiful song sang by millions of angels. The king of kings stood up from his throne to welcome the new born. He carried the baby in his hands, with a smile he lift up the baby and say "this is my beloved child in whom I am well please". The baby, curdle in the arms of his father could sense the father's love. Rom 5:5 "...the love of God is shed abroad in our hearts by the Holy Ghost which is given unto us." (KJV). Rom 8:15 "...but ye have received the Spirit of adoption, whereby we cry, Abba, Father." (KJV). The bady was so overwalm with the love of the father and cried "Abba, Father". The new testament was written in Greek and the actual word written is pronounce "Abba oh Pater". "Abba" in the traditional language spoken during the time of Jesus means father. Greek was the general language while Hebrew and Aramaic were the traditional languages during the time this verse was written. It is like a Yoruba person saying "baba oh father" (as English is our general language). This mean God who is the heavenly father is not just a general father but the father that comes from your tribe, the father that begot you, the father that watch you grow up, that know you intimately, that knows your strenght and your weakness. The new born felt the love of the father like the only child of a loving father who will give him the whole world, who will run to his rescue when he is in danger, who will never leave him nor forsake him, who will not just be his father but also his companion and best friend. This is the love the new born felt that make him cry "Abba Father". The minister who brought salvation to him could sense all these events in the spirit but he couldn't see it. He said in his heart "look at this beautiful baby God has placed in my care, if only I carry out my responsible effectively, if only I guide and build this little one up, he will grow up to be the pride of the Father. " The baby had been born into the richest family and he will know no lack. He had been born into the reigning family who rule over all the powers in heaven and earth. He has become part of a choosen generation where joy and happiness will forever abide. He is called into a hope of glory. The saint on earth are happy, they say among themselves "a righteous one is born, our God have begot another child and a unit have been added to the body of Christ." A new child is born, a child so fearful and so mighty. A god walk on earth and the devil is in trouble. The powers of darkness gathered, they held an emergency meeting because they sited a potential treat. "What can we do concerning this baby" they say "if we allow him grow he will smash our heads". In panic they plot, with fear they execute their plans but the truth is that they will fail, they are destined to fail. All creation and the earth rejoice because that beautiful day is getting closer. The day when they will all be free from the curse placed on them because of Adam's sin (Rom 8:18-22). A new child is born, another army added to the soldier of Christ. The ones that will go with him into battle and humble all is enemies beneath his feet (Psalm 110:1-3). And when this happens the end shall come and earth will be decorated in beauty. It shall be the home of our God and his glory shall fill the whole earth. A new child is born, the stars gathered to watch, the universe stand in amazement, the greatest miracle has happened, "A NEW CHILD HIS BORN". The new born didn't understand what had happed. He thought all he did was say a short prayer and made a few confessions. He couldn't see beyond the natural. If only he could see and understand the spiritual significant of what he has done. If only he know what he has become. If only he knows, then he will understand the value of this event. 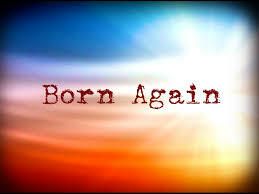 But all he knew is that he had given his life to Christ, he had become born again. Please comment below and share opinion. Do not forget to share this post if it blesses you - just click 'share' bellow.